Multiboot USB stick with bootable Linux Distributions, Acronis recovery bootable images or other tools can be easily created by using freeware application called YUMI. Having multiple distros on USB gives you not only option to run it as a live CD, but also the option to install a distro from the USB stick. You could possibly manually create an USB stick with Grub4dos which can boot an OS or executable from a ‘flat file’ structure or from disk image files or even ISO files. It can even load images into memory (ram drive) and run the OS from there. But YUMI is just so easy that I could not resist to write about it. 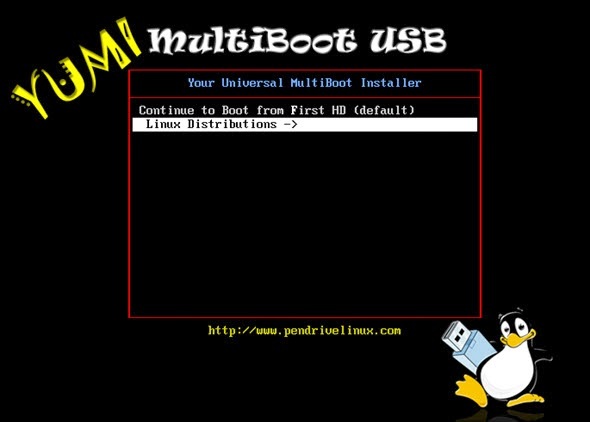 Yumi provides you with a list of pre-programmed Linux Distributions and Utilities that are available for multi-boot USB creation. You can choose any of those tools from a drop down menu. Second step is to point to the ISO file so YUMI can extract the necessary files and copy them to the particular folder on the USB stick. 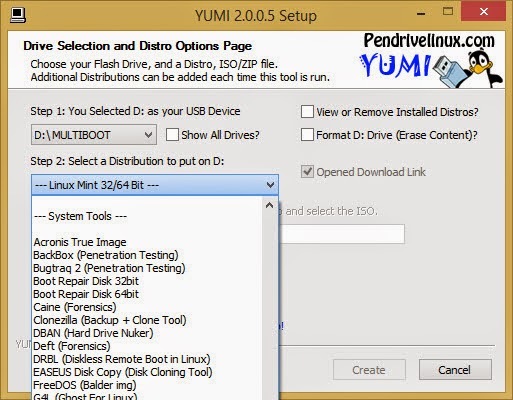 YUMI has almost all distros of Linux but also antivirus, system tools and other utilities which can’t be put into particular category but shall be on every administrator’s USB stick toolbox. After creating one entry, you simply select another one and YUMI adds it as an additional entry to the multiboot menu and so on. If you don’t have locally the ISO, YUMI has a check box which leads you via link to the download page to get the ISO. The files are stored within the Multiboot or yumi folder (depending on version), making for a nicely organized Multiboot USB Drive that can still be used for other storage purposes. There is also a possibility to uninstall a distribution from the USB stick so you don’t have to digg into the USB and manually delete files and directories.